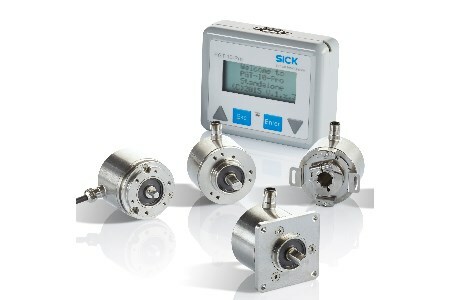 SICK has launched stainless steel versions of its fully-programmable DFS60 incremental encoders and AFM60 and AFS60 absolute encoders, designed for reliable performance in aggressive outdoor, industrial or marine environments where high resistance is required to corrosive atmospheric conditions. The SICK DFS60 Inox, the AFM60 Inox and the AFS60 Inox programmable encoders feature a rugged stainless steel IP67-rated housing, flange and shaft for operation in harsh operating conditions, such as salt and high-humidity atmospheres and in operating temperatures ranging from -30°C to +85°C. They deliver high-resolution, precision motion-sensing performance for plant and machinery, such as cranes, container handling and lifting, and bulk conveyors. The SICK DFS60 Inox is a high-resolution, 16-bit incremental encoder, the AFS60 Inox absolute single turn encoder has a high resolution of 18 bits, while the AFM60 Inox absolute multi-turn encoder has an even higher resolution of 30 bits. With a compact housing for easy mounting in tight spaces, each encoder is available with a square or round flange and solid or blind hollow shaft to match the application specifications. The SICK DFS60 Inox incremental encoders are suitable for high-precision measurement of rotating shaft speed, angle and position for a wide variety of tasks including electric motor feedback and automated handling equipment for speed and position measurement. The AFM60 Inox and AFS60 Inox provide highly-accurate absolute positioning, eliminating the need for time consuming and costly axis-referencing following a power cycle. Variants of the AFM60 and AFS60 with combined absolute and incremental feedback are also available, which enable perfect speed and absolute position control from the same device.